The SR or Set-Reset Flip-Flop works a memory storage element. It can store a single bit of memory working with two inputs named set and reset. When the output Q is 0 then the flip-flop is said to be reset and when it is 1 then it is said to be Set. The output remains between 0 and 1 and is entirely dependent on the inputs. However, one must not get confused with SR Latch and SR Flip Flop. It must be remembered that a latch is level triggered and a flip-flop is edge triggered. Also, SR Latch does not have any feedback, whereas the SR Flip Flop has feedback from its output. Similarly, like latch, an SR Flip Flop can be contrasted with both NAND gates as well as Nor Gate as both serve as the universal gates. The output of SR Flip Flop is called Qn+1 and Q’n+1 (Q bar). There always exists a present value of Q, so the actual output gives the next value of Q hence the name Qn+1. The outputs are always inverted, i.e. if Qn+1 is x then Q’n+1 will always be the 1s component of x. Here x is a single bit, hence either it can be 0 or 1. Because of this toggling effect, we call this device as “Flip-Flop” i.e. it keeps on flipping and flopping. At the NAND gate, flip-flop construction is very simple with two NAND gates. One of the inputs is S’ which goes to the first input of a NAND gate. 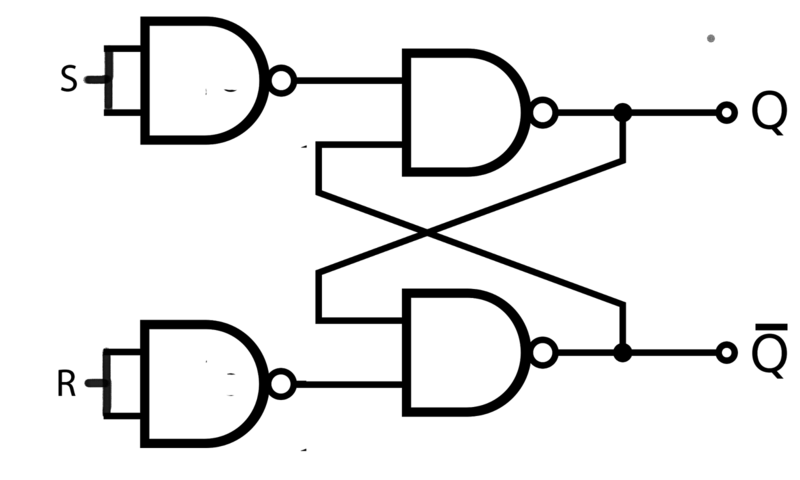 The other input R’ is in conjunction with the other NAND gate. 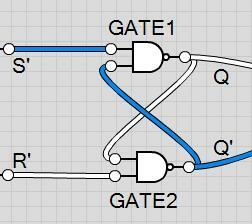 The output of the gate associated with the R input has output Q’ which also acts as the input of the first NAND gate. Thus now the first NAND gate has two inputs, namely S’ and Q’n+1. In similar fashion, the other hand gate also has two inputs, namely R’ and Qn+1. Here Qn+1 and Q’n+1 act as the feedback to NAND gates and thus they are able to store one bit. This formation of NAND gates is also called bi-stable latch. Now let us assume that initially, Qn was 0 thus it is clear that Q’n is 1. Step1: When S=0 and R=0 so S’=1 and R’=1 thus GATE1 output will be 0 and GATE2 output will be 1. Step2: When S=0 and R=1 then GATE1 output will be 0 and GATE2 output will be 1. Step3: When S=1 and R=0 then GATE1 output will be 1 and GATE2 output will be 0. Step4: When S=1 and R=1 then GATE1 output will be 1 and GATE2 output will be 0. Step1: When S=0 and R=0 so S’=1 and R’=1 thus GATE1 output will be 1 and GATE2 output will be 0. Thus, for both Qn=0, 1 while S = 0 and R = 0 Qn+1 remain the initial value Qn. This condition is called no-change. Whenever has S = 0 and R = 1 Qn+1 is set to 0 for both conditions( Either Qn = 0 or 1 ). This is called reset condition. When we have S = 1 and R = 0 Qn+1 is set to 1 for both conditions( Either Qn = 0 or 1 ). This condition is called Set Condition. The RTL Schematic of this SR flipflop should be like this. However, the inputs S = 1 and R = 1 becomes undesirable and impact drastically on the system performance. During this while the clock is 1 the output keeps toggling between 0 and 1 or both Q and Qbar will be of same value which is the race condition her as Qbar must be the complement of Q. If any toggle precedes the other by speed, then the flip-flop will certainly reach into the other state which may not be required by the user or the machine. In this mode, the flip-flop has an enable pin. The enable pin when set to 0 disables the flip-flop hence the output Q and Q’ remain 0 irrespective with the inputs applied. When the enable pin turns 1 then output starts getting value with respect to the input applied. Connect the enable to a timer or a clock and we get a clocked SR Flip Flop. Now according to the truth table when S=0 and R=0 i.e. S'=1 and R' = 1 then we have a race condition or as we know the forbidden condition. 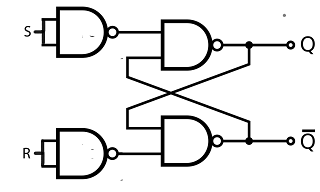 The Output of Master-Slave is of NOR-based FF and is free from same Q and Qbar. When carefully observed this follows NOR FF SR. So we have covered SR FlipFlop with race condition and examples and resolving the condition. Feel free to contact and comment for any mistakes.